nights becomes irresistible. But as they say, the grass is always greener, and after a couple months of drudging through the sun’s rays beating down and the intense humidity, many of us start to long for the cool months of winter. One of the toughest parts of summer is traveling in cars. All of us know how uncomfortable it is to get into a car that’s been baking in a strip mall parking lot or your pavement driveway. The air is hot and thick, and just about everything around is scalding to the touch. Just putting on your seatbelt becomes a delicate maneuver as you try to avoid burning yourself. Fortunately, there are many strategies that you can utilize to keep your car cool and comfortable all summer long. Obviously, cranking the air conditioning all the time isn’t the best way to go. It’s bad for the environment, increases your fuel consumption, and can put more wear and tear on your car. Still, air conditioning is there for a reason, so you should use it when you need to, and use it the right way. For one, always have the temperature turned all the way down if you’re using your car’s air conditioning to cool off. This is because the air is cooled, using your car’s coolant, to the coldest it gets, so any amount warmer than the coldest setting, even if it’s only 62 degrees instead of 60, will have your car both cooling down and then warming up the same air. That’s not only inefficient, it also consumes more fuel. Speaking of which, make sure that you have enough coolant at all times; sometimes people will think their air conditioning is broken, only to find out it’s just lacking coolant. Finally, only use air conditioning on the particularly hot days, and utilize some of these other, more efficient techniques when the burden of heat isn’t so strong. There are a few things that work together to heat up your car when it’s sitting in a parking lot for a while: the heat radiating from the pavement below, conduction from the air around the car, and the effect of the sun’s rays beaming down. When it comes to that last one, you can largely negate the sun’s role in heating up your car. Purchase a sunshade or a window visor to put underneath your windshield whenever you’re parked. The sunshade will reflect light away from your car, preventing the greenhouse-type trapping effect that would happen otherwise. Similarly, you can get a dashboard cover to prevent the sun’s rays from specifically heating up the parts of the car you’ll need to touch. While that second option might not lower the internal temperature of the car, you’ll find yourself glad you have it when you never get burned by the dash. Covering the seats with blankets, keeping any possessions that you leave out of direct sunlight, anything that you can do to avoid contact with the sun, the better. The steering wheel, as well, can be covered up by a simple towel, protected from the heat of the sun’s rays. This might be the most important aspect, especially if you don’t have any of the others, because, while you may avoid touching the dashboard, avoiding touching the steering wheel is impossible. Having a sunshade or a visor is great when you can’t help but park in the sun, but if you can help it, you should generally try to avoid it entirely. If you park regularly in the same area at work, find a spot that’s shaded by a tree or a nearby building for as much of the day (especially the latter half of the day) as possible. If you’re able to consistently park in the shade and avoid the sunshine issue in the first place, then much of the rest of this list will be largely irrelevant to you. If you have access to them, try to park in parking garages: not only will your car be guaranteed shade throughout the entire day, in a nice cool spot, your car will also be generally safer than if it was on the street. Obviously, you can’t just leave your windows down the entire day. Any person walking by may just reach into your car and rifle through your possessions, or even worse, they could snake their way, hotwire the car, and take the whole thing. Still, having some sort of circulation is one of the best ways to avoid that aforementioned greenhouse effect. Find yourself a compromise, then: you want to leave your windows open enough for air to flow freely in and out but with a small enough aperture that any would-be thieves will not fit their hands through them. you’re going to be leaving in about fifteen minutes, go out to the car to get it ready. But this time, instead of turning it on, just open up the doors and get a solid amount of airflow going. A few minutes of fresh air cycling into the car will get rid of that stuffy and oppressive air inside, and make it more comfortable for you when you go to get in. Now, this one might be a bit straightforward, but too many times, people will immediately turn to their air conditioning when it’s even mildly uncomfortable. Try to train yourself into rolling down your windows first. Most often, the cool breeze and high air flow will be more than enough to keep you cool, and on those rare days it’s too hot to drive around even with the windows down, there’s nothing stopping you from rolling them back up and cranking the air conditioning. There are several different methods that can be equally successful. Many of these tips can be used together to maximize the effectiveness. 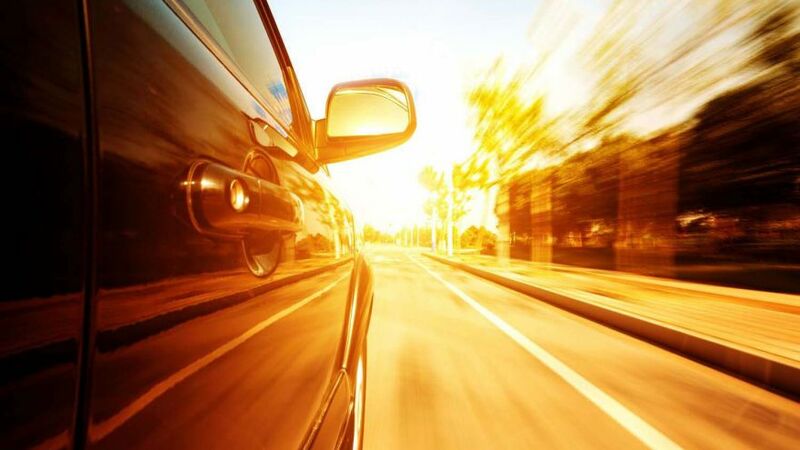 Riding in a cool car definitely makes the trip far more pleasant, but there can be negative effects on the body from being confined to a small and very hot space.